Be the Match Registry ® offers a unique opportunity for you to join in the most uplifting activity you can imagine; the ability to save a life. Their registry is the largest and most diverse in the world – over seven million registry members and umbilical cord blood units, plus another five million potential donors and cord blood units worldwide through their international cooperative registries. By working with Be the Match Registry ® and the National Marrow Donor Program ®, our goal is to diversify the registry. The first step is toward making a transplant possible for a patient, regardless of ethnicity and race. The larger the registry, the more likely it is that a patient will have a matching donor. If you join the registry, we ask that you are committed to donating to any patient in need. Donors never pay for donating, and are never paid to donate. Be the Match ® covers medical costs, reimburse all travel costs and provide other assistance as well. While you do reserve the right to change your mind about being a donor at any time. If you are found to be a match, you will know the patient’s age, gender and disease. You will also know the type of donation the patient’s doctor has requested – Peripheral blood stem cell donation (PBSC) which is the non-surgical procedure or the Marrow donation which is the surgical procedure. You will also be on the registry until you are 61 years of age. And if you are the lucky one chosen to save a life, you will be asked to give a blood sample or another cheek swab sample for further testing. If you are found to be the patient’s best match, you will be asked to make a 30 to 40 hour time commitment spread out over a 4 to 6 week period. This will be used to attend appointments and to donate. If you’re identified as the best match, you may be asked to donate. 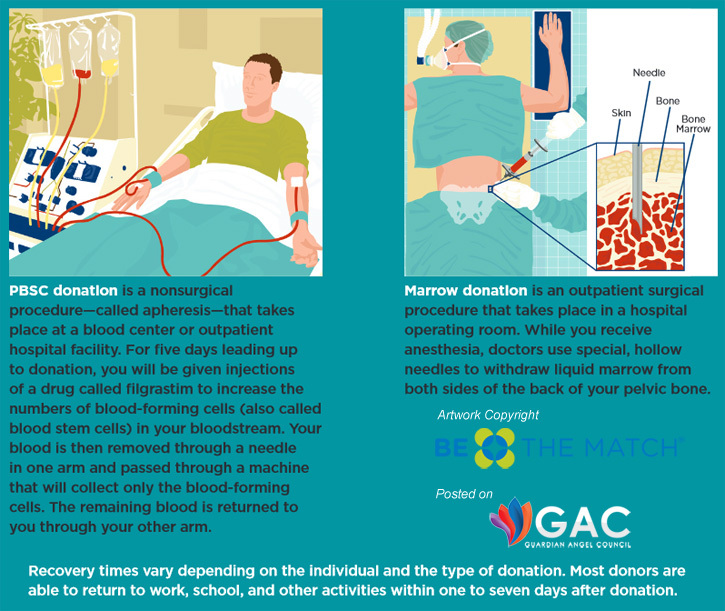 There are two types of donation: peripheral blood stem cells (PBSC) and marrow. The patient’s doctor chooses the donation method that is best for the patient. Be between the ages of 18 and 60. Be willing to donate to any patient in need. Meet the health guidelines below. Ethnic minorities face unique challenges finding a match in the Be the Match Registry ®. Bone marrow donors must be matched to very specific genetic markers which are likely to appear in donors of the same race & ethnicity. Even with full-blooded siblings, the possible combinations of Human Leukocyte Antigens (HLA) make the chance of a match about 35%. Below are some of the most frequently asked questions about the registry. To view this as a PDF, simply click here. Thousands of patients with blood cancers like leukemia and lymphoma, sickle cell and other life-threatening diseases depend on the Be The Match Registry® to find a match to save their life. Patients need donors who are a genetic match. Even with a registry of millions, many patients cannot find a match. Donors with diverse racial or ethnic backgrounds are especially needed. If I am between the ages of 18 and 44, why am I more likely to be called to donate? If you are between the ages of 18 and 44, patients especially need you. Doctors choose donors based on what is best for their patient. When more than one potential donor is a good HLA match for a patient, doctors will also consider other factors, including the donor’s age. Research shows that cells from younger donors lead to more successful transplants. Doctors choose registry members ages 18-44 more than 90% of the time. Yes. If you are between 45 and 60, meet health guidelines and are willing to donate to any patient in need, you can join the registry. You may still be called upon as a match for a patient. You will need to join online with a $100 tax-deductible payment at www.bethematch.org/join. This fee is the cost to add a new member to the registry. As a nonprofit organization, we need to be wise stewards of the generous funding we receive. Since transplant doctors request donors ages 18-44 more than 90 percent of the time, we are focusing our resources on growing the best registry possible for patients. Only those between the ages of 18 and 44 can register at marrow registry drives. We also invite you to help in other life-saving ways, such as making a financial contribution, volunteering or spreading the word about the need for younger registry members. However you choose to become involved, you give all patients more hope for a cure. We thank you! • Donor safety: As one ages, the chances of a hidden medical problem that donation could bring out increases, placing older donors at increased risk of complications. Since there is no direct benefit to the donor when they donate, for safety reasons we have set age 60 as the upper limit. It is important to note that the age limit is not meant to discriminate in any way. • To provide the best treatment for the patient: Research shows that cells from younger donors lead to more successful transplants. one to save a life. Bone marrow transplant is a life-saving treatment for people with blood cancers like leukemia and lymphoma, sickle cell and other life-threatening diseases. First, patients undergo chemotherapy and sometimes radiation to destroy their diseased marrow. Then a donor’s healthy blood-forming cells are given directly into the patient’s bloodstream, where they can begin to function and multiply. For a patient’s body to accept these healthy cells, the patient needs a donor who is a close match. Seventy percent of patients do not have a donor in their family and depend on the Be The Match Registry to find an unrelated bone marrow donor or umbilical cord blood. The first step to become a bone marrow donor is to join the Be The Match Registry. Doctors around the world search our registry to find a match for their patients. If a doctor selects you as a match for a patient, you may be asked to donate bone marrow or cells from circulating blood (called PBSC donation). Why is there sometimes a cost associated with joining the registry? The total cost to add a new member to the Be The Match Registry is about $100. This includes the cost of the testing needed to match donors to searching patients and related costs. Be The Match relies on financial contributions to help cover the costs of adding members to the registry. Others have contributed toward the costs for you to join today. However, there are not always enough funds to cover the numbers of donors needed, so sometimes new members are asked to pay some of the registration costs when they join. Your contribution will make it possible for more people like you to join in the future. Every gift helps make life-saving transplants a reality for more patients. When you join the registry, you will use our registration kit to give a swab of cheek cells. We will tissue type the sample you provide and use the results to match you to patients. If you join in person at a donor registry drive, the Be The Match representatives can explain how to use the swab kit. If you join online, you will receive your kit in the mail. Instructions are included in your kit. • Respond quickly if you are contacted as a potential match for a patient. If you decide you do not want to donate, let us know right away. That way we can continue the search for another donor without dangerous delays for the patient. cells from younger donors lead to more successful transplants. Every person who joins the registry gives patients hope, and new patient searches begin every day. You may never be identified as a match for someone, or you might be one of a number of potential matches. But you may also be the only one on the registry who can save a particular patient’s life. • Bone marrow donation is a surgical procedure in which liquid marrow is withdrawn from the back of the donor’s pelvic bones using special, hollow needles. General or regional anesthesia is always used for this procedure, so donors feel no needle injections and no pain during marrow donation. Most donors feel some pain in their lower back for a few days afterwards. • Peripheral blood stem cell (PBSC) donation involves removing a donor’s blood through a sterile needle in one arm. The blood is passed through a machine that separates out the cells used in transplants. The remaining blood is returned through the other arm. When you join the Be The Match Registry, you make a commitment to consider donating to any searching patient who matches you. As a volunteer, you are never under any legal obligation to donate and your decision is always respected. However, because a late decision not to donate can be life-threatening to a patient, please think seriously about your commitment before deciding to join our registry. You can request a copy of your own testing results after you join the Be The Match Registry. However, if you want to be tested only for a specific patient, you will need to have your testing done privately. You can contact the patient’s transplant center or transplant doctor for more information. I’ve already been tested for a family member. How can I add my results to the Be The Match Registry? Get a copy of your human leukocyte antigen (HLA) tissue typing lab report and contact the donor center in your area. You will need to fill out a health history form to verify you meet medical guidelines. You will also need to sign a consent form agreeing to be listed on the Be The Match Registry. Once you are listed on our registry, we will contact you if you are identified as a possible match for a patient. If you are unsure whether you joined, you can contact Be The Match at 1 (800) 627-7692.